Is there life after "Reveal Codes?" Where's the Paper Manual, Dammittt?!?!?!? Print a list of the contents of any folder? Not for Mac Word: Due to a bug, exclusion dictionaries do not work at all in Mac Word 2004 and 2008. Although the technique described in this article is correct, exclusion dictionaries do not work; and there is no way around that. To make Word question the spelling of a word that is “correctly” spelled according to its dictionary, you need to add the word to an “exclusion” dictionary. An exclusion dictionary causes Word's spelling engine to ignore the entries in the main dictionary for the words it contains. This technique can be a very helpful adjunct to AutoCorrect. For example, I frequently mistype “about” as “abut.” I could get AutoCorrect to change “abut” to “about,” but this might happen without my noticing it sometimes when “abut” was what I really meant. I don't use “abut” anywhere near as often as “about,” though, so I don't mind having it marked as misspelled (even when it isn't) if it saves me from missing a misspelled “about.” I also made haste to add “pubic” to my exclusion dictionary when I realized that on my business brochure I'd cited the Fairhope Pubic Library as one of my references! Note that the procedure for using exclusion dictionaries in Word 2007 differs considerably from that in previous versions, so make sure you read the appropriate section below. Creating exclusion dictionaries is described in the Word Help topic "Specify a preferred spelling for a word." Unfortunately, the Help files and articles on the subject are misleading and, in places, inaccurate. Create your exclusion dictionary as a text file—either using Notepad or by creating a new document in Word and, in the Save As dialog, setting “Files of type” to “Plain Text (*.txt).” when you save it. In your text file, type in the word(s) you want Word to treat as misspelled, one word per paragraph (that is, press Enter after each entry). In other words, you type in the "bad" spellings here. This forces Word to ignore that entry in the dictionary. Do NOT use any capital letters. Type all of your words entirely in lowercase. If you do not, they won't match the main dictionary entries, so they won't work. Your next challenge is to find out what to use as the file name for your dictionary. To do this, you need to find the name of the main dictionary (lexicon) file. In the case of Office 2000 and above it will be called Mssp3*.lex, where * represents your language. In Office 97, the file is Mssp2_*.lex. Systemdrive stands for the name of the drive in which Windows is installed (usually “C”). Pray that you see a file named MSSP3EN.LEX in there. If you do, you've found the main English dictionary. If you do not see that file, use Search in Windows Explorer (My Computer) to search your Program Files folder for MSSP*.LEX. Make sure you click More advanced options and specify that the search is to look in Hidden folders and System folders, or you will not find anything. If you work in American, Canadian, or UK English, your main dictionary is named MSSP3EN.LEX, so your exclusion dictionary must be named MSSP3EN.EXC. In other words, the exclusion dictionary always has the same name as the main dictionary, but with an .exc file extension instead of .lex. 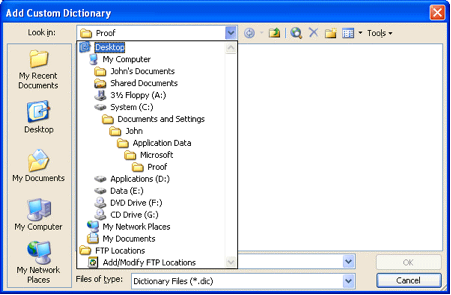 In Office 97, you save the file in the Proof folder where the main dictionary resides. Where <homedrive> is usually "C:" drive. At the bottom of that dialog, the path to your custom dictionary is shown. Regrettably, the dialog is not usually large enough to read the full path. Click the little downward arrow to the right of the Look in: field at the top. It will drop down the full hierarchy as shown. As you can see, this Custom Dictionary is in the default location on the C drive. Follow the instructions in the Help topic and save your exclusion dictionary in this location. In the Custom Dictionaries dialog, click Add, which will open the folder where CUSTOM.DIC is stored. Change “Files of type” to “All Files (*. *).” You should see your exclusion dictionary listed. Select your exclusion dictionary and click OK. Your exclusion dictionary will now be listed in the Custom Dictionaries dialog. When you want to add a word to it, you can select it, choose Modify…, and add words as required. You may want to read the material above for general principles, but in Word 2007 you don’t have to create an exclusion dictionary; Microsoft has already done that for you. The challenge instead is to locate the correct dictionary for the language you are using. Note: It would appear that these dictionaries are created when you use or enable a given language. Each dictionary will be applied only to text in the language specified. Open Microsoft Windows Explorer (My Computer or Computer). An easy way to do this is with the keyboard shortcut Winkey+E, where “Winkey” is the Windows key on your keyboard (the one with the Windows logo on it). Click the View tab of the dialog. On the menu bar, click Tools, then Folder Options. Click the View tab of the Folder Options dialog. Locate the exclusion dictionary for the language whose settings you want to change. The name of the file you need to open is ExcludeDictionaryLanguage CodeLanguage LCID.lex. The Language Code is a two-letter code such as EN for English or FR for French. The Language LCID (Locale ID) is a four-digit numeric code. You can find a very complete list of these codes here [Lene Fredborg, 11-Feb-2018: Removed outdated link to http://www.microsoft.com/globaldev/reference/lcid-all.mspx], but this chart does not include the Language Codes. The chart here is not as complete but does include the Language Codes. In both instances, the last four digits of the hex value (not the decimal value) are what you want. As you can see, there is much more granularity of language differentiation in the exclusion dictionaries in Word 2007 than in previous versions (where a single dictionary was used for U.S., U.K., and Canadian English, for example). Note also that the file uses the “dictionary” suffix .lex rather than .exc as in previous versions. Edit the file using the text editor of your choice (such as Notepad or WordPad). Add each word that you want the spelling checker to flag as misspelled. Be sure to type the words in all lowercase letters, and press ENTER after each word. Once you have found the appropriate dictionary file and added words to it, you have passed the highest hurdle. Unfortunately, unlike previous versions, Word 2007 doesn’t allow you to open and edit the exclusion dictionary through the Custom Dictionaries dialog. Therefore, if you want to make it easy to open and edit the file, you may want to create a desktop shortcut to it, add it to your favorites, or, if you are editing it as a text file in Word, pin it to the file list under the Office Button.